You've noticed a mole, sore, or growth on your skin that doesn't look right. It might be a melanoma and time to see a doctor. 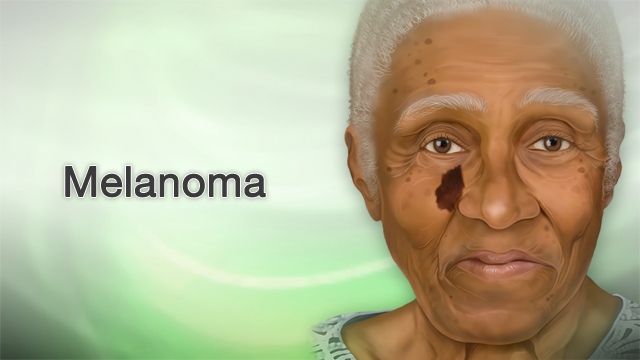 Melanoma is skin cancer caused by changes in cells called melanocytes. These cells make a skin pigment called melanin. Melanin's what gives you your skin and hair color. 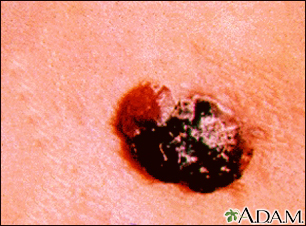 Melanoma can appear on normal skin, or it may begin as a mole or other area that has changed in appearance. 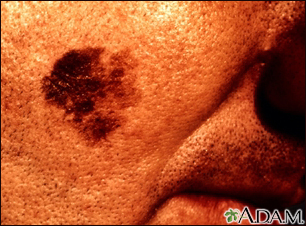 Some moles you have when you're born can develop into melanoma. 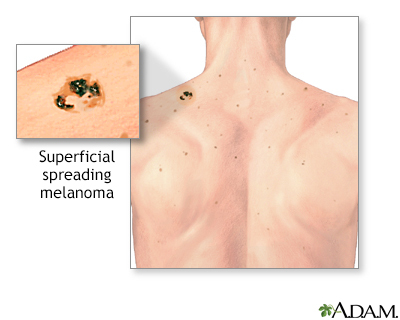 There are four types: superficial spreading melanoma is the most common. It's usually flat and irregular in shape and color, with different shades of black and brown. It's most common in Caucasians. 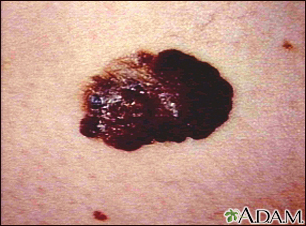 Nodular melanoma usually starts as a raised area that is dark blackish-blue or maybe bluish-red. 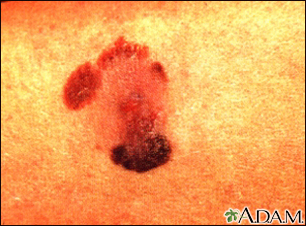 Lentigo melanoma usually occurs in older adults. It's more common on sun-damaged skin on your face, neck, and arms. It's usually large, flat, and tan, with areas of brown. 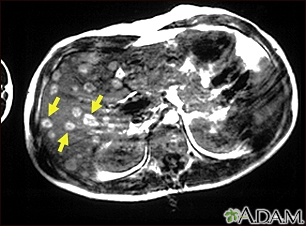 Lastly, accrual lentiginous melanoma is the least common form. 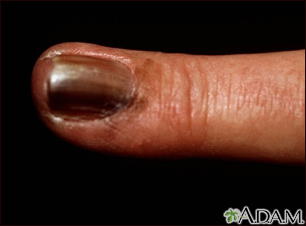 It usually occurs on your palms, soles, or under your nails. And it's more common in African-Americans. 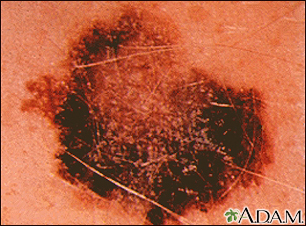 The risk of developing melanoma increases with age, but it is often also seen in young people. You are more likely to get melanoma if you have fair skin, blue or green eyes, or red or blond hair. People who live in sunny climates or at high altitudes are also at risk. As are people who spend a lot of time in the sun, or had one or more blistering sunburns during childhood, or use tanning devices. So, how do you know you have melanoma? You may have a mole, sore, lump, or growth on your skin that just doesn't look right. You may notice a sore or growth that bleeds or changes color. One half of the growth may be different from the other. The edges of the growth may be irregular. The color of the growth may change from one area to another. The spot may be larger than 6mm in diameter, about the size of a pencil eraser. The mole may keep changing in appearance. So, what do you do about melanoma? To treat melanoma successfully, you have to recognize the symptoms early. Make sure somebody sees all of your skin at least once a year and pay attention to your own skin. Call your doctor if you notice anything unusual. Your doctor will examine your skin for size, shape, color, and texture of any suspicious areas. If your doctor thinks you may have skin cancer, you'll have a piece of skin removed and sent to a laboratory for testing. This is called a biopsy. You may also have a lymph node biopsy to see if the cancer has spread to nearby lymph nodes. If you are diagnosed with melanoma, you may have other tests to see if the cancer has spread further. You will need surgery if you have melanoma. The doctor will remove the skin cancer and some of the surrounding tissue. If the cancer has spread to nearby lymph nodes they will also be removed. After surgery, you may need medicine called interferon. If the cancer has spread to organs, it may not be able to be cured. Treatment then might focus on shrinking the cancer and making you as comfortable as possible. You may need chemotherapy, immunotherapy, radiation treatment, and more surgery. 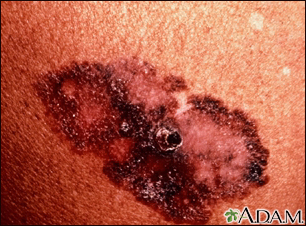 Caught early, some of the types of melanoma can be cured. 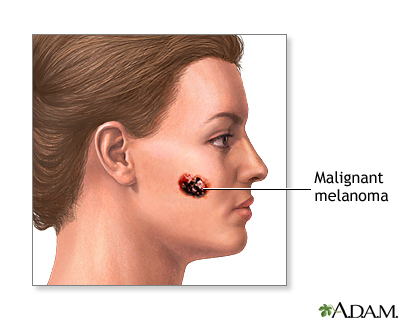 Melanoma that is very deep or has already spread to lymph nodes is more likely to return after treatment. And the odds are even worse if it has spread farther to other organs. If you have melanoma and recovered, it's important you continue to examine your body for any unusual changes because the cancer may return many years later. One more reason that the earlier you catch it the better.